Located in the rolling hills of Campobello this beautiful home is a short country drive from Landrum, Spartanburg, and Greenville SC. 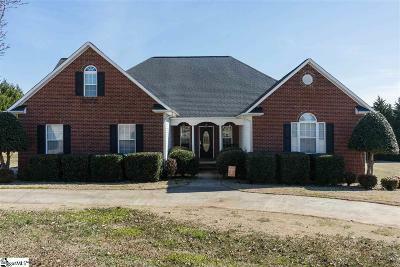 Situated on a 1 acre level lot with a privacy fenced backyard and circle driveway this sprawling home features a split floor plan with a huge bonus room and walk in attic. The best feature of this home is the size of the rooms. From the giant great room and master bedroom to the oversized guest rooms this home will fit the largest of furniture and still provide ample space. The split bedroom plan has the master suite well removed from the rest of the home with the guest rooms and guest bath located on the opposite side of the great room. The kitchen is well appointed with a double oven, stone countertops, and a large dining area. The new deck and patio are great for entertaining or relaxing. Don&apos;t miss an opportunity to tour this beautiful home today.